Much scholarly attention has been paid to how new media call for and influence the development of new literacies, but less focus has been given to exploring the underlying structure and mechanisms of projects that incorporate multiple media. Transmedia stories represent a particularly complicated and compelling type of multimedia project because of the high degree of integration among the components and resulting demand for sophisticated reading and interpretive practices. 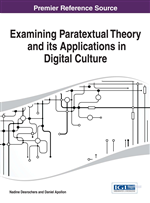 This chapter proposes a model for analysis of transmedia projects based on Gérard Genette's Paratexts: Thresholds of Interpretation and uses Scholastic, Inc.'s The 39 Clues as a case study for its application. In a world where children are bombarded with messages in multiple media and limiting “screen time” has become a daily battle in many households, exploring how stories that develop across multiple media demand new literacies and consider readers as consumers has become a central concern of children’s literature and media scholars (Sekeres, 2009; Sekeres & Watson, 2011; Dusenberry, 2010). As part of both promoting and taking advantage of new literacies, publishers have increasingly turned their attention toward developing stories that are deployed across, and therefore require engagement across, multiple media: HarperTeen’s The Amanda Project (2009), Running Press’s Cathy’s Book (2006), Random House’s Fairy Godmother Academy (2009), Dial’s The Looking Glass Wars (2006), and Scholastic’s Skeleton Creek (2009) and The 39 Clues (2008) are all examples of this type of story (Hill, 2010). Since transmedia projects consist of collaboration across multiple media (and in some instances, such as The 39 Clues, within a series in a single medium), a single author does not exist as such for the project as a whole, so I have indicated the publisher of each project for reference above. For a list of specific authors and websites associated with each project, please see Appendix 1. Publishers/producers as well as media critics and scholars have adopted the term “transmedia” as one way of labeling these types of projects. At the most basic level, transmedia means “across media” (Jenkins, 2011, para. 7), which emphasizes that connections between components are crucial to building and engaging with these stories. While many writers have offered definitions and theories of transmedia, media scholar Henry Jenkins initially adopted it in 2003 and has developed it extensively through multiple books and blog posts. So, for the purposes of this paper, I will largely rely on Jenkins’ elaboration of this term. Jenkins (2011) defines “transmedia storytelling” as “a process where integral elements of a fiction get dispersed systematically across multiple delivery channels for the purpose of creating a unified and coordinated entertainment experience” (para. 4, emphasis original).